The Versailles boys swim team won the Coldwater Invitational (the Unofficial MAC Meet) for the 12th consecutive year recently. PORTLAND, Ind. 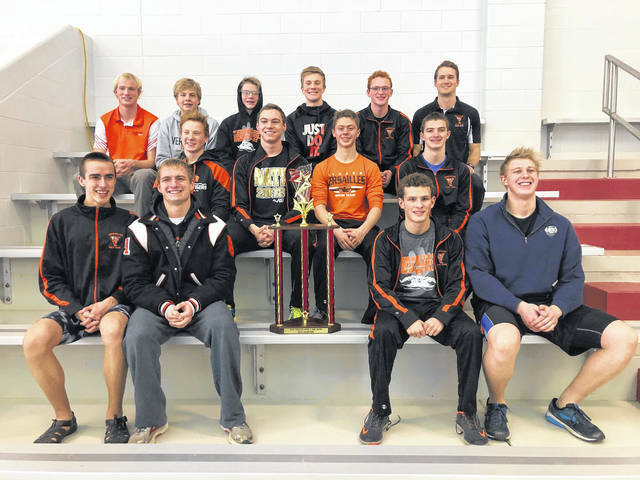 – The Versailles High School Boys swim team captured the team championship for the 12th consecutive year at the Coldwater Invitational (Unofficial) MAC Meet on Friday, Jan. 26. The meet was held at the Jay County High School in Portland, Ind. with six teams participating. Swimming started as a sport in Versailles in the fall of 2006 with the first Unofficial MAC meet being held in January of 2007, at the Celina YMCA. That year Versailles only had two freshman and three sophomores out for swimming and lost the first MAC meet. Since then, the Versailles boys swim team has never lost the MAC Meet and this year was no exception with a total team effort. The boys recorded 14 PR’s in the win. Cole Condon finished first in the 50-yard freestyle setting a new meet record and first in the 100 butterfly. Ryan Subler finished first in the 100 backstroke and first in the 200 freestyle. Owen Schultz was first in the 100 breaststroke. Stuart Baltes finished second in the 200 IM and second in the 500 freestyle. Jack Detrick was second in the 50 freestyle and fourth in the 100 butterfly. Evan VanSkyock was third in the 100 breaststroke and fourth in the 200 IM. Jarrett Petitjean was fifth in the 100 freestyle. The Versailles Boys A Relay Team finished first in the 200 freestyle relay and first in the 200 medley relay and second in the 400 freestyle relay. The Versailles High School Girls swim team finished third at the Coldwater Invitational (Unofficial) MAC Meet on Friday, Jan. 26. The meet was held at the Jay County High School in Portland, Indiana with seven teams participating. All of the Girls swam fantastic and were able to nose out Fort Recovery by 2 points and in doing so chalked up 32 PR’s. Alexis Jay was third in the 500-yard freestyle and sixth in the 200 IM. Deanna Day was fourth in the 200 freestyle. Madelyn Holzapfel was fourth in the 200 IM and fourth in the 100 backstroke. Lauren Menke was fourth in the 100 breaststroke. Lucy Prakel was fifth in the 100 breaststroke and sixth in the 100 butterfly. Sara Cavin was fifth in the 200 freestyle. Tori Ahrens was sixth in the 100 freestyle. The Versailles Girls A Relay Team finished fourth in the 200 medley relay and fourth in the 200 freestyle relay and fifth in the 400 freestyle relay. Arcanum finished in third place on both the girls and boys team standings at the recent Cross County Conference swim meet. The Lady Trojans totaled 70 points while the boys team had 41. Also in the girls standings, Tri-Village finished fifth with 29 points, and for the boys Ansonia was fourth with 18 points. Individually, the Arcanum girls were led by Isabella Gable, who won the 100-yard butterfly in a new meet record time of 1:00.37. The University of Tennessee commit also won the 500 free (5:13.54) and was a member of the second-place 200 medley and 200 free relay teams. Gable was joined on the 200 medley team by Elora Sudduth, Brittany Stump and Madelyn Wogoman and they finished in a time of 2:10.68. The 200 free foursome included Allie Barry, Sudduth, Wogoman and Gable and they finished the race in 2:00.95. Other placers for Arcanum included Sudduth in second place in the 500 free (7:22.61) and eighth place in the 100 breast (1:35.01), Wogoman in sixth place in the 100 free (1:14.0) and eighth place in the 50 free (30.87), Barry in seventh place in the 50 free (30.34) and seventh place in the 100 breast (1:30.59) and Stump in fifth place in the 100 back (1:24.31) and sixth in the 100 breast (1:30.04). Tri-Village’s Edie Morris captured first place in the 100 back (1:10.56) and also took second in the 100 breast (1:18.7). Lucie Morris finished second in the 100 free (58.96) and third in the 100 butterfly (1:03.34). For the boys, Arcanum had three first-place swimmers including two by Jimmy Barry. He placed first in the 200 free (2:03.47) and first in the 1650 free (20:50.15). Stephen Young had the other first-place title in the 50 free (24.89). Young also was second in the 100 free (55.35) and Jacob Egnor took fifth in the 100 back (1:54.66) and 10th in the 50 free (40.3). For Ansonia, Connor Stachler won both the 100 butterfly (1:05.57) and the 500 free (6:08.93). The Arcanum girls took second place with 53 points at the Troy Christian swim meet last week. The Trojans were led by the 200-yard medley relay team of Elora Sudduth, Brittany Stump, Madelyn Wogoman and Isabella Gable by finishing as the race runner-up in 2:34.1. The 200 free relay girls also took second place in a time of 2:15.7. That foursome included Allie Barry, Sudduth, Wogoman and Gable. Individually, Sudduth took second place in the 100 free (1:10.45) and fourth in the 200 free (2:40.84). Also, Wogoman came in second in the 100 butterfly (1:22.85) and third in the 200 IM (3:05.95), while Barry was runner-up in the 50 free (32.98) and placed fourth in the 100 breast (1:33.55). Stump finished third in the 50 free (34.13) and third in the 100 breast (1:31.42). The Arcanum boys placed fourth as a team with 18 points. They were led by Stephen Young, who claimed first place in the 200 IM (24.96). Young also placed third in the 100 free (55.48). Jimmy Barry was runner-up in the 100 breast (1:11.53) and fifth in the 200 free (2:06.09). Ansonia’s Connor Stachler placed second in the 100 butterfly (1:05.4) and sixth in the 200 free (2:09.0).